Advisor to the EEC Secretary’s Office Apichart Thongyu said Thailand will gain about 30,000 short-term jobs as the government’s Eastern Economic Corridor project ramps up, but will lose hundreds of thousands of jobs long-term unless the country improves its education system. Thailand will gain about 30,000 short-term jobs as the government’s Eastern Economic Corridor project ramps up, but will lose hundreds of thousands of jobs long-term unless the country improves its education system, an EEC board meeting was told. 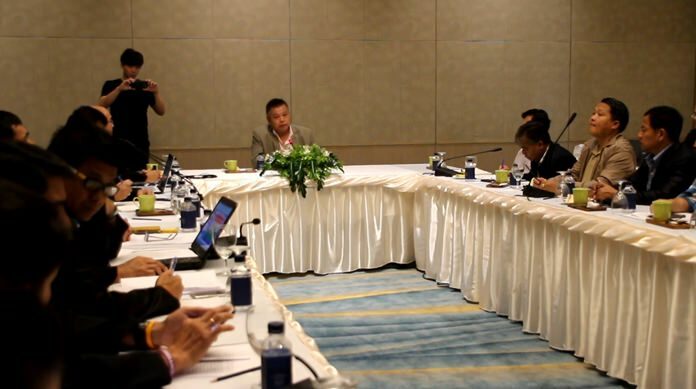 Advisor to the EEC Secretary’s Office Apichart Thongyu told vocational school educators and officials from Chonburi, Rayong, Chachoengsao and Trat, at the Aug. 4 meeting at the Myatt Beach Hotel in Pattaya that 400,000 people already are unemployed because they lack the skills to get jobs in high-tech industries. That will only increase unless Thailand radically reforms its education system to train people for tomorrow’s jobs that are the focus of the EEC project. Discussing the short-, medium- and long-term effects of EEC development, Apichart said the Eastern region stands to gain 30,000 jobs, but all of them will be in low-skill laborer positions building the required road, rail and air transportation projects called for. Once those logistics projects are complete the employment focus shifts to high-tech industries targeted by the EEC and the government’s Thailand 4.0 initiative such as electronics and telecommunication equipment, eco-friendly petrochemicals, digital-based industries, robotics, automation, aerospace and medical devices. Thailand is woefully unprepared to train workers in those fields and public officials at all levels of government have been wringing their hands for years about how to upgrade vocational schools and universities with no success.